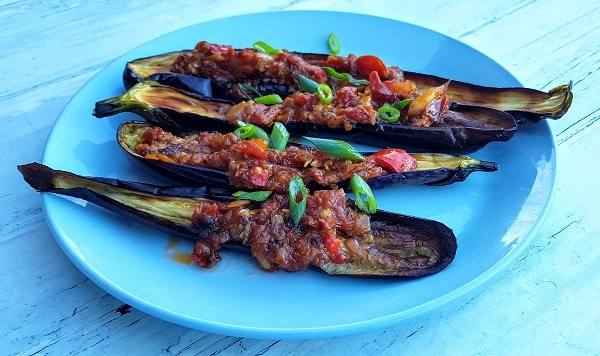 Lately, my local greengrocer has been stocking the variety of eggplant that I grew up eating back in Malaysia (correct me if I’m wrong, but I often see them referred to here as Japanese eggplants), and it prompted me to get some for one of my favourite Indonesian Padang dishes known as Terung (Eggplant) Balado. 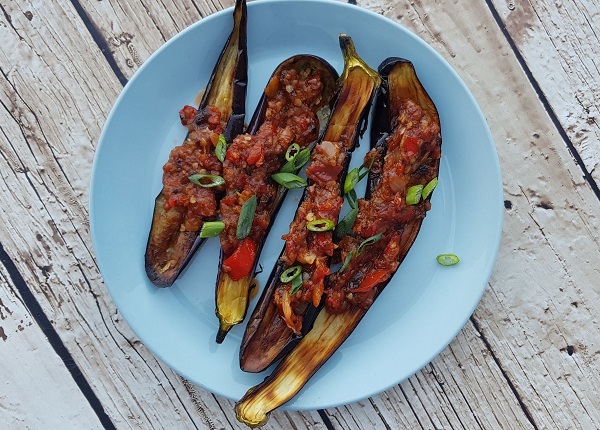 I air-fried the eggplants in my Optimum HealthyFry during my Live Asian Kitchen broadcast so as to free up my stove for the balado sauce, but you could just as easily pan-fry them with some oil or grill them in the oven. Also, I used chicken powder in the sauce, but substitute that with half the amount in salt and just like that, you have yourself a vegan dish. Brush eggplant halves with oil, then grill/airfry or pan-fry them until soft. Set aside. Dice tomatoes; mince onion and garlic. Combine onion, garlic and chilli paste in a wok or pan and fry until the moisture is reduced. Add oil and fry until onion is caramelised. Add tomatoes and cook for another minute, followed by all other ingredients. Simmer until mixture is reduced by half, remove from heat and spread on eggplant to serve.